On Saturday, January 17, Rapidough Pizza Pies in the Providence Town Center, Collegeville, Pennsylvania, will host what they're calling a kick off to THE YEAR OF THE PIZZA. "It's a new year and it's an opportunity for everyone to discover the best pizza ever," offers Nick Farrell, partner in the unique restaurant. Rapidough Pizza Pies opened in April with a restaurant model boasting offerings that are better than fast. In fact, when customers enter Rapidough Pizza Pies, they build custom pies, delicious calzones and fresh salads on an easy-to-use iPad interface and they're enjoying delicious gourmet food about five minutes later. "People appreciate fast but they also desire quality," adds Nick's brother, Tom Farrell. "We knew there was a way to deliver both and to do it with food that everyone loves." People do love pizza and that's why Rapidough Pizza Pies– whose tagline is Best. Pizza. Ever. –decided to celebrate 2015 as The Year of the Pizza and to host a day-long party for the entire community. The year-long tribute to pizza kicks off with a party on Saturday, January 17, that will include live music, food specials, special guests and a lot of surprises. Special guests at The Year of the Pizza event include a local brewery and distillery. 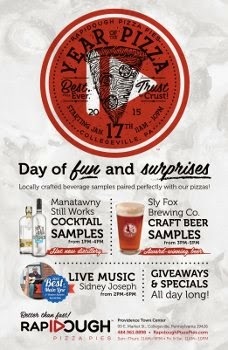 Sly Fox Brewing Company, Pottstown, PA, will offer samples of their beer and special pairings with Rapidough's seasonal pies and day-only creations. Manatawny Still Works, also headquartered in Pottstown, will be pouring samples from their portfolio of spirits and offering cocktail samples that pair with Rapidough's pies, salads and calzones. You do not want to miss these combinations of locally-owned brands all coming together in one fantastic event. Live music will be provided by Sidney Joseph who was named Best Local Musician with National Potential by Main Line Today. Joseph fuses acoustic-based rock, R&B grooves, Latin rhythms and hip-hop attitude for a sound without boundaries and he will rip through dozens of popular songs new and old, keeping the party lively. Besides the food specials and samples there will be other surprises and giveaways throughout the day.